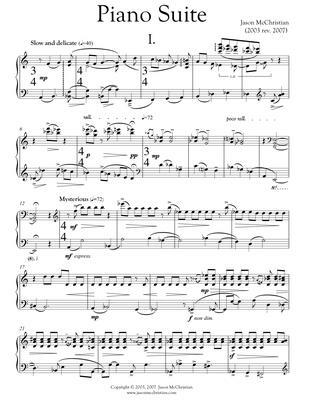 Piano Suite was a study in creating a cohesive collection of movements representing both absolute and program music. Cast as a theme and variations, Movement I was influenced by the music of Brahms and Schoenberg through their thematic variation. 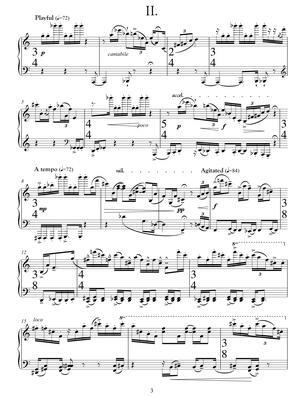 From the first notes of Movement II each of the pianists hands play a wide range apart and throughout the work only occasionally do the hands meet in the middle range of the piano. This movement also features arpeggiated figures and syncopation giving the work a jazz-like flavor. 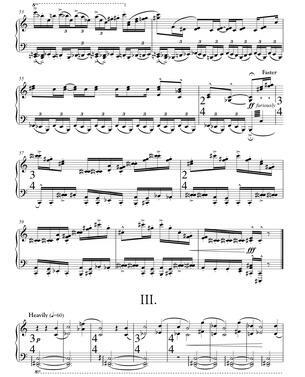 Containing a theme similar to that heard in Movement I, Movement III is harmonized using major and minor 7ths. Only a minute long, this movement follows without break to the final movement. 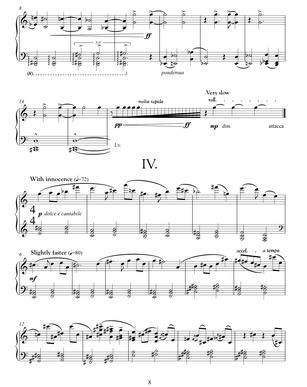 Subtitled "Happy Bird, Hungry Cat" the final movement refers to images of a bird singing, a cat pouncing, both giving chase, and at the final chord - a terminal CHOMP! Influenced by cartoon-music and the Hungarian folk music of Bartok, this piece uses common compositional textures and devices such as a lyrical melody with chordal accompaniment and ostinato.